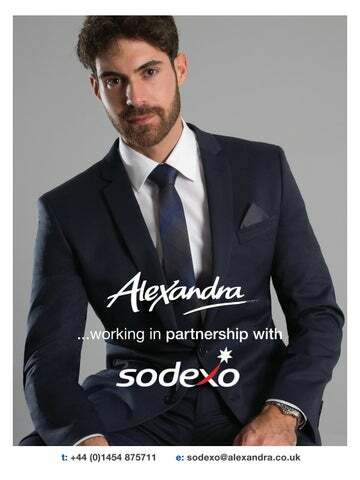 Welcome to your Sodexo Non-Core Uniform This guide has been produced full colour logo to showcase the range of uniforms and accessories provided by Alexandra for Sodexo employees. DETAIL is our easy to use ordering platform that gives you greater control and visibility of uniform inventory on your own in-house system. Once you have created your account, you will be able to view your organisation’s unique product list and benefit from the discounts and special pricing that have been set up on your account. account number, please quote this when placing an order. •	If you are ordering via a SAP system then a PO number must be provided. •	If you are ordering via an E-prophit system please provide your full name. •	Sodexo Justice Services: please note a PO number must be provide for all orders. Each order should be for more than 10 items per style colour otherwise the unit price will increase by 100%. It’s easy to return an item to us and If you want to order a replacement garment in the meantime, just go ahead and place another order in the usual way. Returns should be made within 7 working days. If you have a quality issue please can you notify us within 3 working days. Lead times Non embroidery orders: despatched within 3 working days from when the order is placed. Embroidery orders: despatched within 7 working days from when the order is placed. Screenprint orders: despatched within 10 working days from when the order is placed. For full details and conditions please check the website or speak to your dedicated contact. Welcome to your Sodexo Non-Core Uniform. Please refer to the how to measure and size guides at the back of this catalogue to ensure you order the best fit for you. Alternative colours may be available - contact the Sodexo Helpdesk for details. Three distinctive ranges - all off the shelf. Choose from Cadenza, Icona or Easycare to create a personal look that suits you best. Cadenza by Alexandra is a superbly tailored collection that will transform your opinion of workwear suiting. Featuring a luxurious, soft-touch fabric with more than a touch of pure new wool, our fashion-led styles and sharp detailing give you outstanding quality and performance. Available in a choice of fits, a wide range of sizes and leg-lengths, the Cadenza by Alexandra collection is the obvious choice to create a professional image for your business. 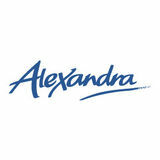 Colour choice Cadenza by Alexandra is available in 3 fabric colour choices. Washcare instructions Machine washable at 40 degrees with a non-biological liquid. Slow-spin or drip-dry on a hanger to retain shape. Lightly press with warm iron using clean cotton cloth to prevent shine. For more guidance, see our website. Fashionable, feminine and functional Embrace your fashion-conscious femininity. Workwear doesn’t need to be boxy and unflattering, as this beautifully shaped, expertly cut dress demonstrates. Fully lined with a clever, stretch lining so that you can move in absolute comfort, with three-quarter length sleeves to suit every occasion. Alternatively, the straight skirt looks equally smart teamed with either of the NF700 or NF701 Cadenza jackets. Contemporary and lightweight, hard working and functional, the Icona by Alexandra suiting collection offers you a choice of seventeen mix-and-match garments with which to create the perfect working wardrobe for your business. Our designers have taken the latest fashion styles and then added features that make the collection even more comfortable and practical to wear - such as concealed elastication, Teflon stain-resistant coating and stretch linings. This is our most stylish, but also serviceable suiting ever. Colour choice Icona by Alexandra is available in 3 fabric colour choices. Washcare instructions This textured birds-eye weave fabric is easy to wash, quick drying and a dream to iron. All garments are suitable for a 40 degree domestic wash and when hung to dry will only require a quick press with a warm iron and you are ready for hard day in the office. The impeccable styling of the Icona by Alexandra slim-fit jacket, typifies the care that has been put into the look and feel of the whole collection. Understated but confident, well-made and versatile. Ready for business. Head-turning style The Icona by Alexandra short jacket gives modern power-dressing a feminine twist. Beautifully fitted and undeniably elegant for every-day wear. The Easycare by Alexandra suiting collection gives you a good-looking, contemporary, super-economic solution for high turnover roles such as hospitality and retail. The 100% polyester fabric is soft and smooth to the touch and light enough to wear all year round. It’s also incredibly hard wearing and easy to wear. Simple, flattering tailoring for all shapes and sizes, keeps a smart appearance with the minimum of fuss and at the end of a long week, simply pop it into the washing machine. Colour choice Easycare by Alexandra is available in 2 fabric colour choices. Washcare instructions Easycare by name, Easycare by nature. Simply wash at 40 degrees in a domestic washing machine; drip-dry on a hanger and press lightly with a warm iron if required. Dress to impress Classically shaped, the Easycare by Alexandra NF134 Round neck dress features a flattering back zip fastening. Stretch shirting Ultimate comfort comes from wearing clothes that stretch when you do. Our stretch shirting range is made from cool, crisp cotton blended with elastane for that extra bit of ‘give’. Oxford shirting The traditional Oxford weave fabric chosen for this shirting gives a textured, subtle two-tone appearance. It’s a little more casual and yet always business-like. Woven colour shirting Five styles, designed to suit both men and women, all made from the same cotton-rich fabric, in a palette of bright clean colours to co-ordinate with your branding. Print blouses Classically shaped women’s blouse made from a crisp polyester/cotton poplin, in 2 elegant prints. Print blouses Add a fashionable pattern to your uniform with our collection of printed blouses, available in a choice of prints and colours. Whether you want to add some knitwear for warmth or for style, the CL26 jumper is perfect for the job. Great choice and flexibility, without compromising quality, comfort or performance. Garments that reflect your brand and culture. Cooking in style Our Performance and Precision chef jackets are designed with the latest technologies to withstand the unrelenting rigours of commercial catering and laundering. Cooking in colour Trend-led design that gives you the flexibility you need to work in comfort - while the industrially launderable polyester/cotton mix fabric offers practical, robust performance. Co-ordinate your look To turn up the volume on your brand look, pick from our fresh, palette of apron colours. Available in three classic styles, with or without pockets. Make a statement A flash of bold, solid colour gives this apron a cool, contemporary look. Choose from 3 striking colours in two styles. Classic check Cotton-rich classic, woven from our crisp, cotton-rich windowpane check fabric. Contemporary check Beautifully crisp polycotton men’s and women’s shirt. Fabric and finishes that will give you unbeatable performance - always standing up to the rigours of the job - across all roles. Classic collar This classic tunic has truly stood the test of time. An all-time favourite. Elegant and comfortable A satin-piped sunburst adorns this black dress to give a subtle touch of class to a flattering style. The gentle contouring gives shape without restricting your movement. Our designers know what is required to make workwear 100% fit-for-purpose - ensuring it is comfortable and practical to wear. There’s nothing worse than being cold when you need to perform at optimal capability. These core garments will keep you warm. Measuring A good fit is vital for a professional look and wearer comfort. Workwear garments are designed to allow for movement in the role that they are designed for, which means there can often be a sizing variation between the different styles. It is therefore important that you measure yourself accurately and do not rely on â&#x20AC;&#x2DC;guessingâ&#x20AC;&#x2122; your size from the garments you wear outside of work. The guides below show you where to take your measurements correctly. Once you have these measurements to hand, you will find that each product in this catalogue recommends a sizing table to refer to, so that you can select the garment size that will best fit your measurements. Menâ&#x20AC;&#x2122;s measure guide Chest Measure over the fullest part of the chest under the arms and straight across the back. Measure 3cm below navel with the tape snug but not tight. Measure from the crotch to the desired trouser length. Tips for how to measure correctly •	Use a flexible cloth or plastic tape measure - not a metal one. •	Measure yourself wearing light underwear only or on bare skin. •	Relax your body and hold the tape measure flat against your body, but not tight. •	Use a mirror to check that you are holding the measure correctly. •	To measure your inside leg measurement, either sit down with your legs out straight in front of you and measure from the very top of your leg to the ankle (allow for the height of shoes that you would normally wear with your workwear). Alternatively, use a pair of trousers that already fit you perfectly and are the same length as you require. •	Don’t forget to check the recommended fit for every garment before you order, as sizing does vary between garments. Women’s measure guide Bust Measure over the fullest part of the chest under the arms and straight across the back. Waist Measure 4cm above the navel with the tape snug but not tight. Inside leg Measure from the crotch to the desired trouser length. How do I know what size I am? The size guides on these pages are a guide as to what size you would be in our products. Each product within this catalogue references one of the 4 size guides shown here. Please ensure you are referencing the correct size guide and order line when choosing your order size.